Dexter Daily: Latest From Watch With Kristin - What's Next for Dexter and Deb? Latest From Watch With Kristin - What's Next for Dexter and Deb? Latest from the spoiler chat daily column of eonline.com. Read after the jump a scoop from executive producer Sara Colleton regarding Dexter and Deb's relationship in this season! Beth: The Dexter premiere was insane! Loved every minute of it. 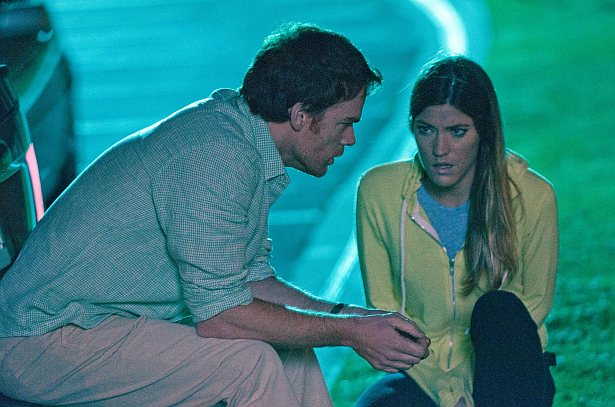 What's next for Dexter and Deb now that he admitted to being a serial killer? "It has rocked his world. He has to learn to live with that at any moment, she could, if she wanted to, turn him in," executive producer Sara Colleton tells us. "It's a level of uncertainty he cannot control…he's got a loss of freedom and a greater sense of responsibility than he's ever had and that's difficult." As for Debra, she teases, "Something will happen that will absolutely bedevil her and she'll have to figure and navigate her own way and path through the problem."